Based on the life of Sidonie-Gabrielle Colette, the film follows the writer through her marriage to Henry Gauthier-Villars, who whisks her away from her quiet and humble life in the countryside to live in the bustling and lively Paris. Henry, better known as “Willy,” is a successful Parisian writer who, while relying on an army of ghostwriters to produce his work, uses his time to engage in other self-indulgent activities — including numerous affairs with other women. He soon enlists his wife as one of his ghostwriters. He initially dismisses her contributions, but soon decides to re-work and publish Colette’s writing under his own name in order to save their family from financial ruin. Throughout their tumultuous marriage, Colette remains honest, consulting with Willy about her confusion over her newly discovered attraction to other women. While she seeks permission for her explorations, Willy does not offer the same courtesy, consistently betraying Colette’s trust and continuing to exploit her talents in order to publish her wildly successful work as his own. 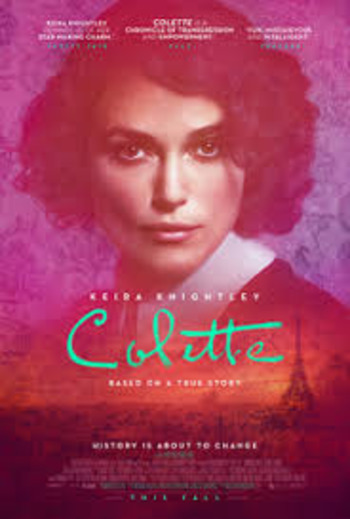 As their marriage begins to deteriorate, Colette finds a place for herself within her writing and begins to explore her creativity through a variety of artistic avenues. Keira Knightley quietly simmers as Colette, a trailblazing figure committed to breaking through stereotypes and conventions.